Strict ratios listed below will be enforced during all camp activities including recreational swim and swim lessons. 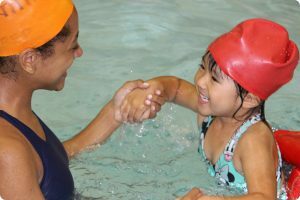 All classification of swimmers and non-swimmers will be done by the Aquatics Staff under the guidance of American Red Cross certified Water Safety Instructors. *During recreational swim, any classified non-swimmer that is in shallow water greater than chest deep must wear a life jacket. 1:3 ratios will still be met. *Any seizure prone child will have buddy tag marked with a dot indicating they require 1:1 counselor/camper supervision.